When I travel to winegrowing regions, I taste a lot of wines – often 60-100 or more a day – and I ask a lot of questions. If you’re not going to do both, why travel? Sometimes the wines surprise me and sometimes the answers surprise me. I always learn something new. On my most recent trip to Burgundy, I learned a lot. I’ve been going to Burgundy pretty regularly now for over 18 years. In that time, I’ve learned a lot about the winemaking but long before I ever visited Burgundy, I knew that Burgundian red winemaking meant fermenting Pinot Noir grapes in open-top fermenters and managing the cap using pigeage or “punch downs.” That’s what I had been taught, that’s what all the books said, that’s what I expected to see, and – when I got there – that is in fact what I saw. Open-top fermentation tanks with the apparatus necessary to punch down through the “cap” of skins that forms on the top of the juice. No surprise there. Why is this necessary? To understand, we need to start at the beginning or at least the beginning in Burgundy. By the time winemaking made it to Burgundy, people knew how to make wine. Once enough juice is released, the indigenous yeast from both the vineyard and the winery start the fermentation. The fermentation produces both heat and carbon dioxide. The heat helps break down more grapes and release more juice further fueling the fermentation. And the carbon dioxide makes it a bad idea to get back in the tank as you wouldn’t be able to breath. So from the start of fermentation on, the grapes were manipulated by pushing down through the cap with either a plate-on-the-end-of-a-pole or a sort of four-pronged-square-fork-on-the-end-of-a-pole. As carbon dioxide is heavier than air, it tended to stay on the surface of the fermenting juice so someone standing on top of the tank punching down with a long pole was OK. Not that anyone knew what yeast or carbon dioxide was. They were doing what experience had taught them. Once the juice was mostly released, it was run off and finished fermenting without the skins. Vatting times were generally short (no more than three days) and the resulting wines were light red in color and fairly light bodied. As time passed, vatting times increased and the wines got (somewhat) darker and (a bit) richer. It turned out that there was a lot of color and flavor in the skins. It also turned out that there was a lot of bitterness in the stems. As time passed, some winemakers began removing the grapes from the clusters and just putting only the grapes (without any stems) in the vat. The grapes gave up their juice more readily as the network of stems did not provide structure to keep the grapes from getting crushed. Pigeage (punching down) was still the order of the day. Longer vatting times put a higher priority on managing the cap. Left to itself, a tank of fermenting grape juice and skins will separate into the juice below and the cap floating on top. And the cap is further pushed up by trapped carbon dioxide release by the fermenting juice. Since there is flavor and color in the skins, the wine maker wants the skins in contact (as in mixed in) with the juice so that flavor and color can be extracted. So someone had to stand on top of the tank and, using a punch down pole, poke through the cap down into the fermenting wine. This both pushed grape skins (and pulp and trapped seeds) down into the wine and allowed wine to come up into the hole created and seep from there into the cap. In each vat, several holes were punched through the cap once or twice a day depending on how active the fermentation was for 5-7 days. The other reason to punch down (or otherwise keep the cap wet) is that spoilage organisms can colonize if the cap is allowed to dry out. Fast forward to modern times. 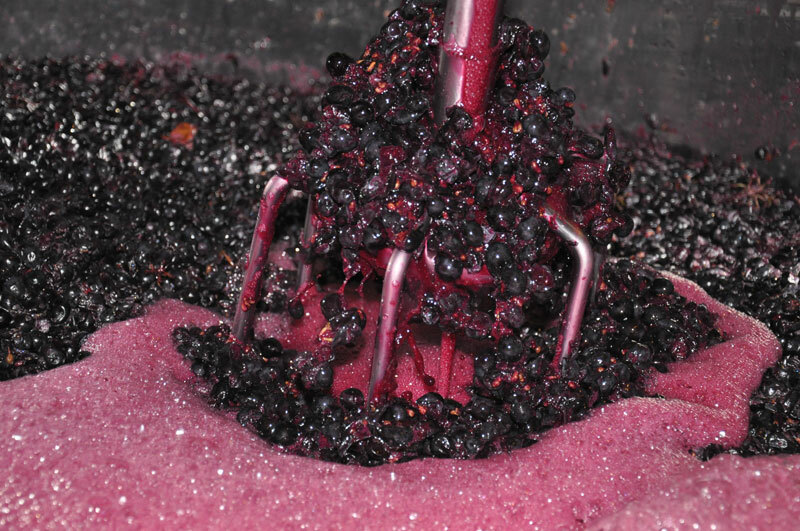 The red Pinot Noir grapes of Burgundy are generally brought into the winery and run through a crusher/de-stemmer. Some producers both de-stem and crush the grapes. Some producers only de-stem so as to get whole berries into the tank and some add some whole clusters (anywhere from 10% to over 50%) to the tank. Some producers use all whole clusters. Most Burgundian winemakers use a cold pre-fermentation maceration or “cold soak” before allowing the fermentation to start. The cold soak allows an aqueous (water-based) extraction to draw out color and flavor before alcohol is formed. Alcohol extracts tannins which are not soluble in water so tannin extraction doesn’t start until after the actual fermentation gets going and produces alcohol. To cold soak, the winemaker either chills the tank down using the tank’s temperature control or (old school) adds dry ice. The goal is to get the temperature in the tank to below 12°C. The grapes are kept like this, macerating in their own juice for from three to as many as ten days. During this cold soak, the cap forms and must be managed. The options are to punch down or pump over. 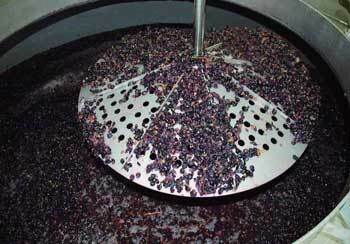 Punching down (pigeage) breaks open or crushes more grapes and releases more juice. Pumping over (remontage) takes the juice from the bottom of the tank and sprays it over the top to filter back down through the cap. The advantage to pumping over is that it is gentler. The disadvantage is that pumping over can introduce extra oxygen to the wine – and Pinot Noir tends to be oxidative so too much oxygen can be a real problem. Conventional wisdom says that Pinot Noir producers punch down and because Pinot Noir is less extracted than say, Cabernet Sauvignon (which is usually made with pump-overs), that punching down is the gentler process. Both statements are less than fully true. Starting with the second premise, standard plate-on-pole (or now more often plate-on-the-end-of-a-hydraulic-ram) punching down is actually a more aggressive extractive technique as the plate breaks, tears, and crushes the skins which allows more extraction of flavor and color. Pumping over is more gentle as only the juice is moved and no metal comes into contact with the grape skins. The idea that most Burgundian Pinot Noir producers are using only punch downs as an extractive technique is more challenging. Just looking around certainly makes it seem that way. Most Burgundian wineries have lots of open top tanks whether wood, concrete, or stainless steel (or even plastic or fiberglass). And many have rails mounted on the ceiling above the tanks from which hangs a hydraulic ram with a punch-down plate at the bottom that can slide into position over each tank to make the punch downs. But when you start talking to wine makers and asking detailed questions, another view emerges. Most of the best winemakers I saw on this trip say they are doing at least as much pumping over as punching down and some say they have virtually abandoned pigeage. Maybe they are pumping over in the cold soak, doing a little pigeage as the fermentation starts and then finishing with pump-overs. Some winemakers say there are a few days where they will do one pump-over and one pigeage. And some winemakers showed me a sort of four-pronged fork with which they were doing their pigeage rather than using the plate-at-the-end-of-the-pole. They say the fork is gentler and tears the grapes less but they are still pumping over as well. The only winemakers that almost have to do at least some pigeage are those that are using all whole cluster as there is initially very little juice in the bottom of the tank. Until enough grapes break open to release enough juice to pump over, pigeage is necessary. Once there is enough released juice, they can (and many do) switch to pumping over. And then there are the wineries, mostly newer, where there are no open tops or pigeage equipment. The first of these I noticed was several years ago when I visited Vincent Girardin on the east side of Meursault. On my most recent visit to Burgundy, I noticed that the Vignerons de Buxy co-op in Montagny had no open-tops and they acknowledged that all the wines are made with remontage (pumping over). The wines were clean and fresh and showed no oxidative problems so apparently they have it figured out. In visiting a number of other wineries they told me they were using the same sort of closed tanks (which I had incorrectly assumed were just for blending or white wine making) to vinify red wines. Who knew? If Burgundy is so good – and (at least at the top of the quality pecking order where I work) it is – why change? There are several reasons. Grapes are riper. Winemakers now better understand aqueous (water) extraction versus alcoholic extraction. They better understand what happens with seeds during fermentation. They better understand what happens with stems during fermentation. They better understand both sugar ripeness and phenolic (stems, seeds, and skins) ripeness. The younger wave of winemakers has more education. All the better winemakers have more tools at their disposal. Newer better pumps make pump-overs gentler and less oxidative. The conventional wisdom that the best Pinot Noirs from Burgundy are made using only punch-downs is incorrect. At this point, it is safe to say that most of the best properties are using both techniques (pigeage and remontage) on the same wine but it seems that there is (currently) as much or more pumping as punching going on. Myth Busters would be proud.